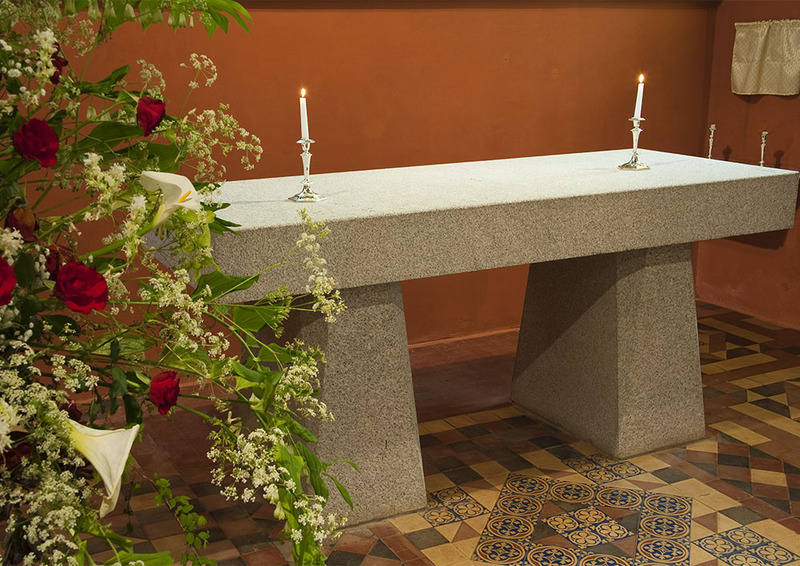 Hilary, a fourth-century bishop of Poitiers, seems to have been regarded at least since 1179 as the patron saint of this church; certainly the parish feast was in the late nineteenth century celebrated on 13 January, St Hilary of Poitier’s day. There is a painting of him in the nearby parish church at Breage. This ancient church, partially enclosed by a rampart, possibly occupies the site of a Roman fort. Visible from north and south coasts its fine spire was formerly a landmark for seafarers. This was the only part of the building to survive the disastrous fire on Good Friday 1853, all the pre-Reformation bench-ends being destroyed as well as most of the memorials. The church was rebuilt by 1855 on much the same footprint, to a design by William White of Truro early in his distinguished career. The building is spacious, with the roof supported on slender pillars, and visitors comment on its peaceful and prayerful atmosphere. The tower today contains six bells. Of the three original bells two were dated 1674, one of these being broken and not used for many years. The third was, according to the churchwardens’ account book, cast in 1804 by John Harvey, who was paid £20-8-3d. The surviving bells were restored by Harry Stokes of Woodbury, Devon, and new ones cast to make the ring of six, by Warner & Son of London. 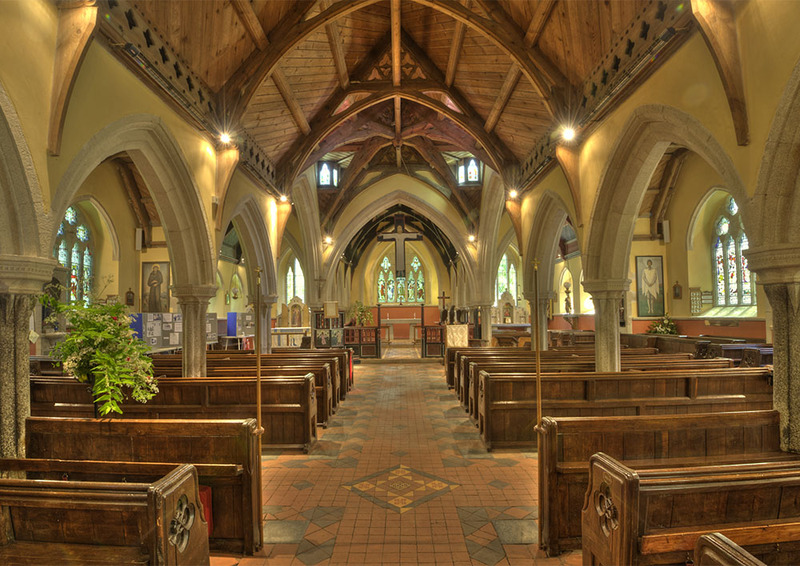 During the 1920s the Vicar, Bernard Walke, invited many Newlyn School artists to contribute works to decorate the church and he also installed statues and other paintings from other sources. 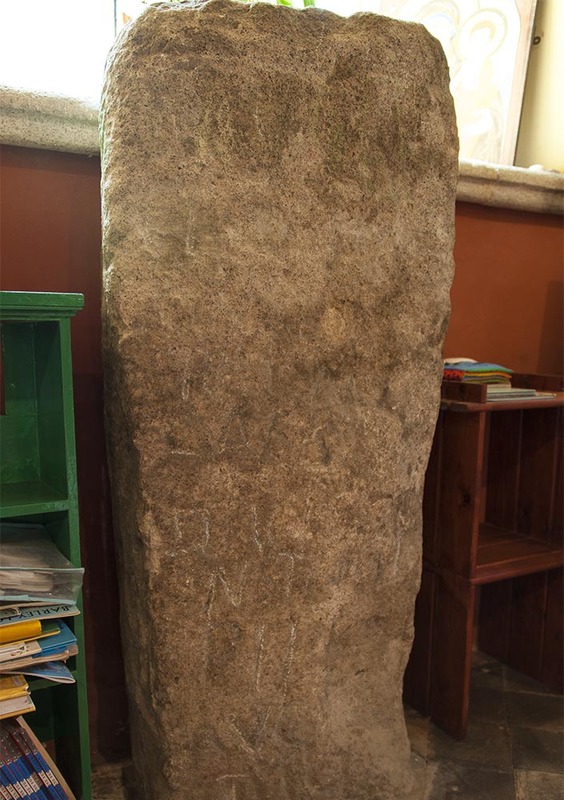 Some of these artifacts and his Anglo-Catholic practices were highly controversial and resulted in a Consistory Court and a raid by Protestant activists in 1932. Items were removed, some damaged in the process, but over the succeeding years many have been returned. 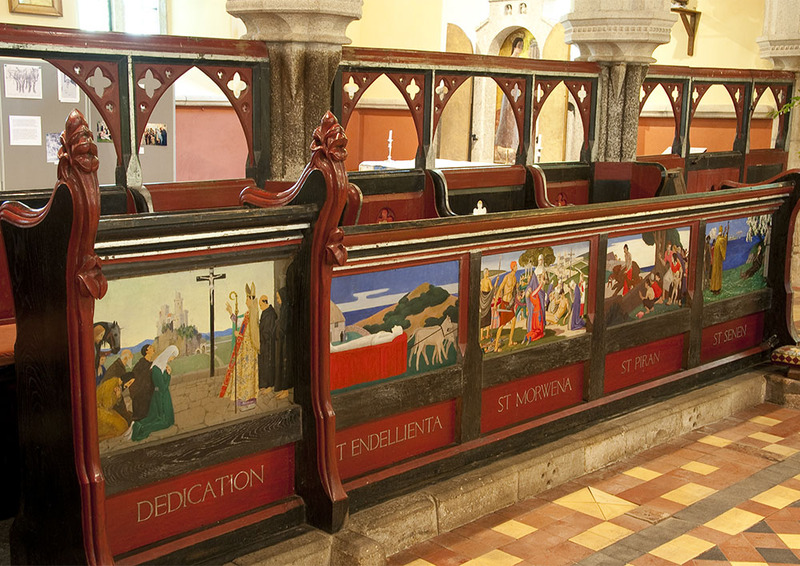 Fine works of art may still be seen, including the uniquely painted choir stalls and screens, showing legends of Cornish saints. 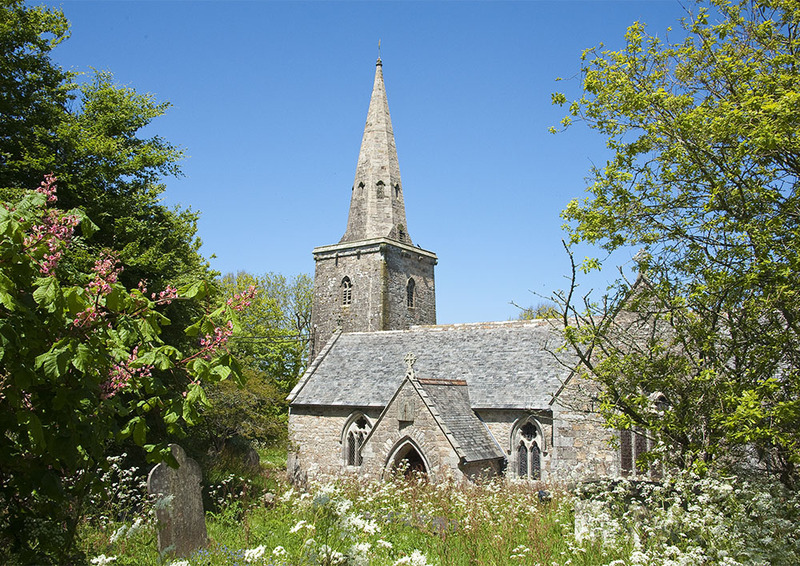 A small Heritage Centre has been opened adjacent to St Hilary Church which has interpretative panels and other information about the Church. Click here to learn more. Tower and spire of late 14th or early15th century date, whitewashed as a seamark. 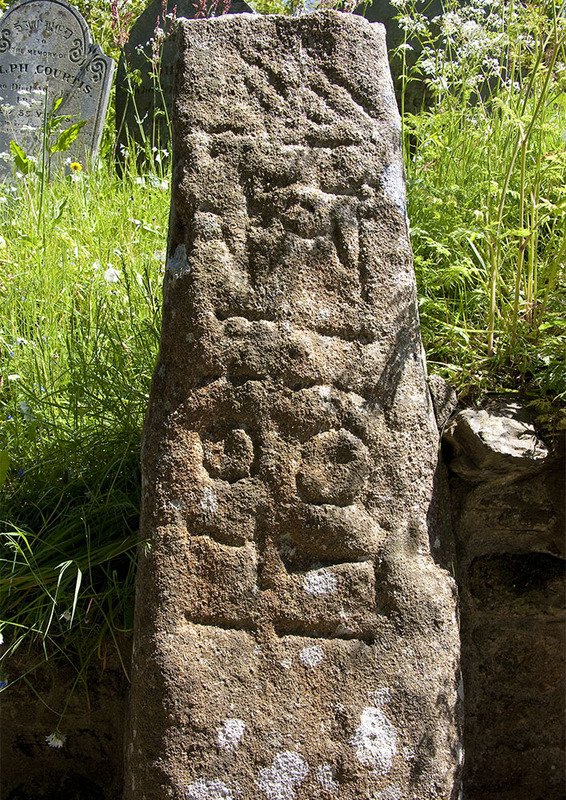 A Dark Age memorial stone just inside the main gate, inscribed NOTI NOTI – probably commemorating a local man, Not son of Not. Many elaborate and impressive tombs in the old churchyard. (For information about them, and details of their inscriptions, see Lake’s Parochial History volume II pages 186-1900.) Newlyn School artists including theProcters and Garstins are buried in the new churchyard, near the War Memorial. 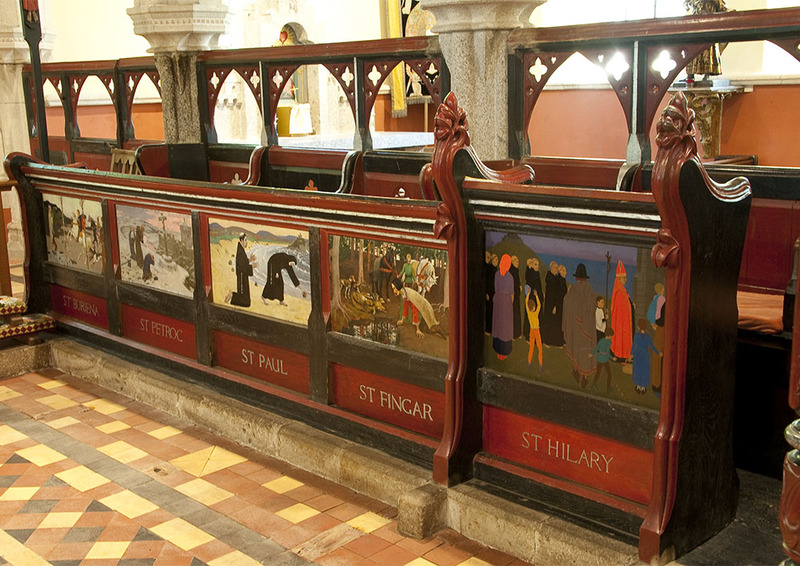 Choirstalls and screens painted in a scheme by Ernest Procter, incorporating panels depicting the lives of Cornish saints. These are by Newlyn School artists including the vicar’s wife Annie Walke, Harold Knight, Harold Harvey, Gladys Hynes, Norman and Alethea Garstin and Dod and Ernest Procter. Panels in the Lady Chapel screen are painted by the child-prodigy artist Joan Manning-Sanders when only 12 years old. 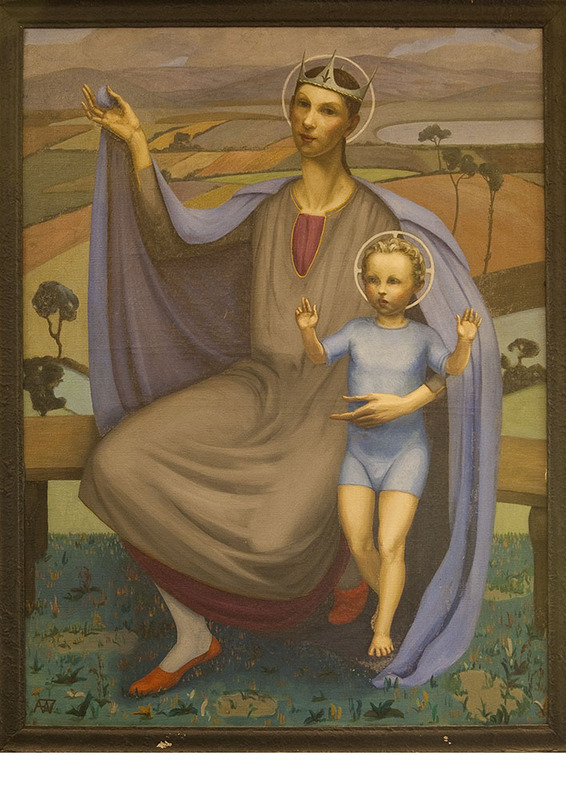 Paintings by Annie Walke of St Joan (modelled probably on Dod Procter) and of the Virgin and Child and a painting of St Francis by the Bloomsbury Group artist Roger Fry. 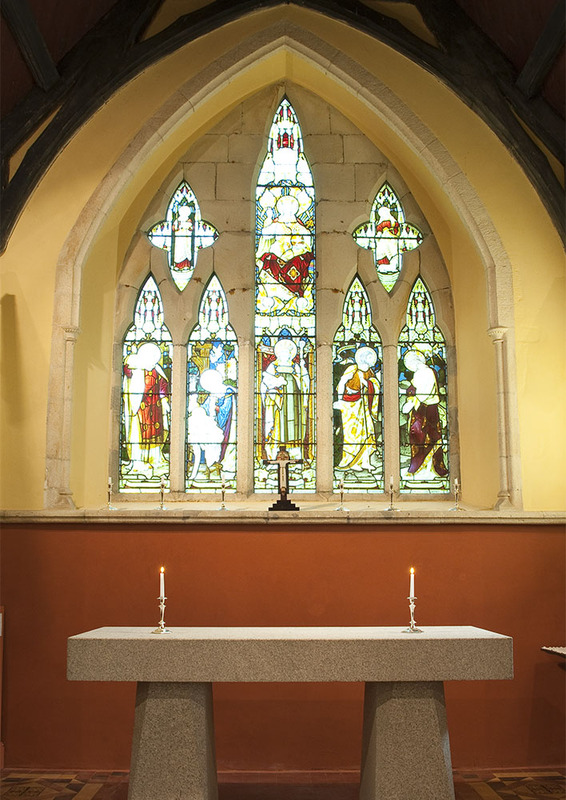 Stone altars designed by Ernest Procter and made by Newlyn craftsmen. 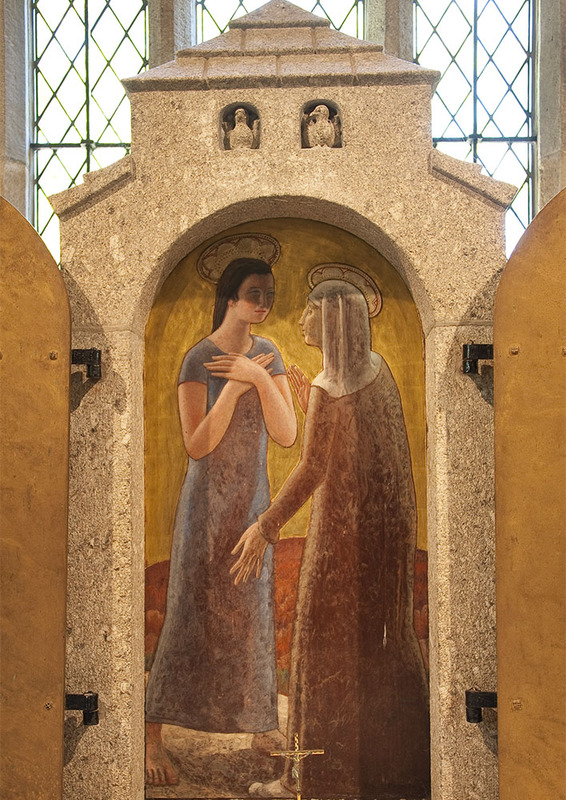 Large altar painting by Ernest Procter of The Visitation, painted on sculpted wood. 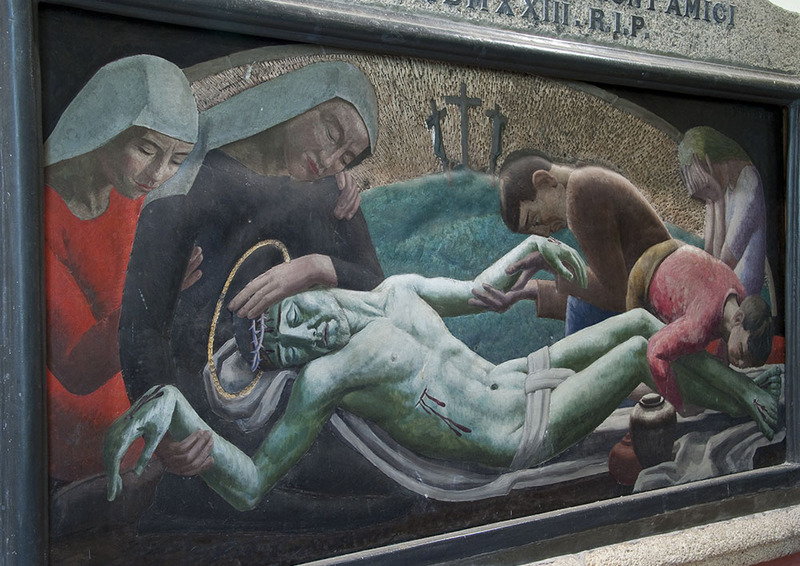 Large painting by Ernest Procter of The Deposition of Christ at back of the church which is etched and painted on beaten copper – a memorial to fellow-Pacifist Gerrard Collier. 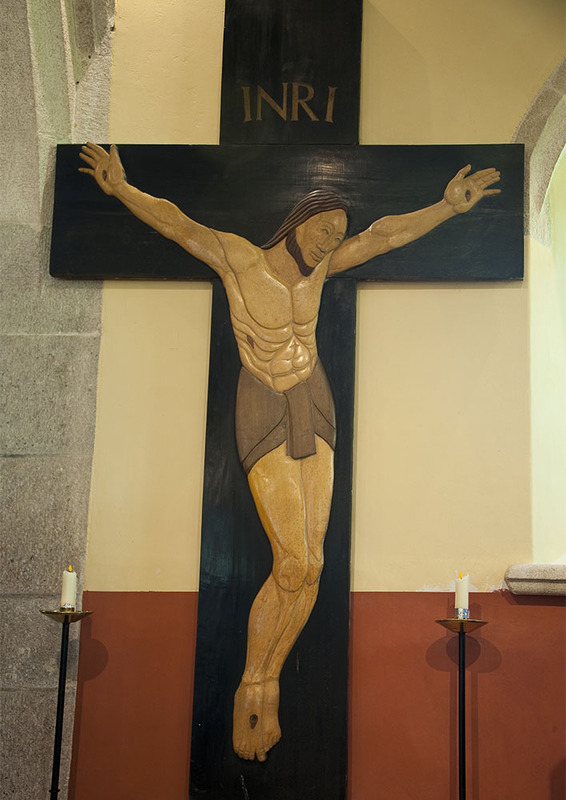 A large wall-mounted crucifix by local artist Phyllis Yglesias, carved in wood.